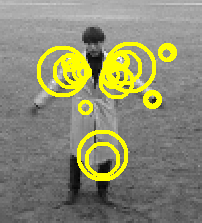 Abstract : Local space-time features have recently become a popular video representation for action recognition. Several methods for feature localization and description have been proposed in the literature and promising recognition results were demonstrated for a number of action classes. The comparison of existing methods, however, is often limited given the different experimental settings used. The purpose of this paper is to evaluate and compare previously proposed space-time features in a common experimental setup. In particular, we consider four different feature detectors and six local feature descriptors and use a standard bag-of-features SVM approach for action recognition. We investigate the performance of these methods on a total of 25 action classes distributed over three datasets with varying difficulty. Among interesting conclusions, we demonstrate that regular sampling of space-time features consistently outperforms all tested space-time interest point detectors for human actions in realistic settings. We also demonstrate a consistent ranking for the majority of methods over different datasets and discuss their advantages and limitations.